So Ramadan is coming to an end and I kind of dug myself into a hole. I posted a Facebook status saying that kunafa with Nutella is kind of disgusting. And apparently everyone thought that meant I was a kunafa purist. Which I’m totally not. I just think that syrupy kunafa doesn’t go with sickly sweet chocolate goo. Ew. 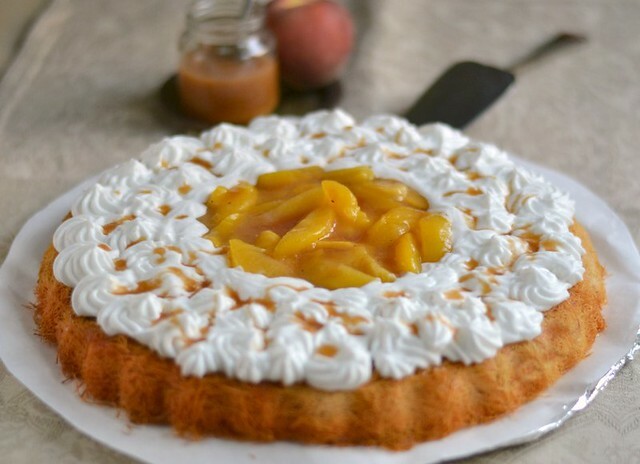 But kunafa and fresh peaches, now that is another story. 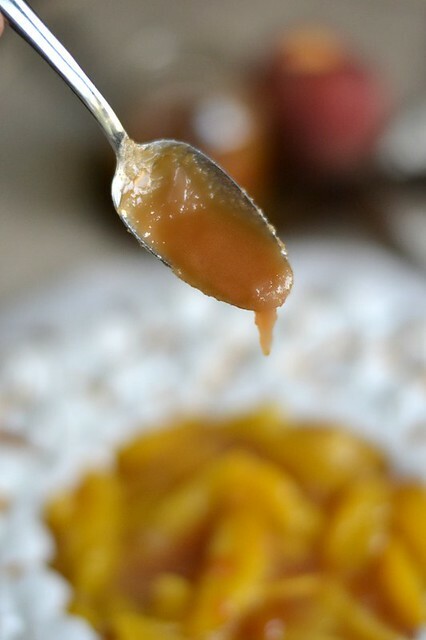 Imagine this; warm slices of peaches with hints of vanilla and cinnamon sandwiched in between two layers of kunafa, topped with whipped cream and drizzled with caramel sauce. 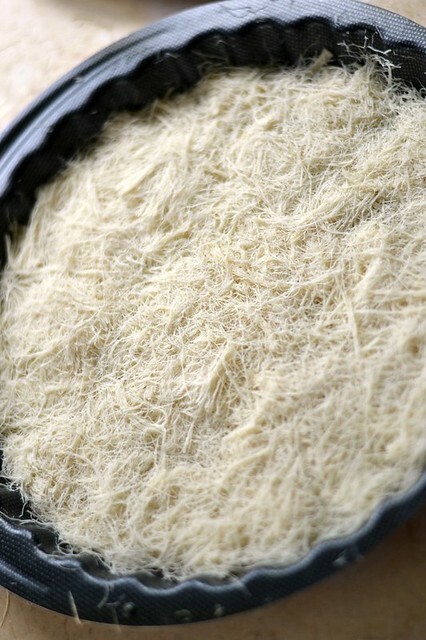 Grease your pan and work oil well into kunafa strands. Pat the first kunafa layer into the bottom of the pan, pressing on it until even. 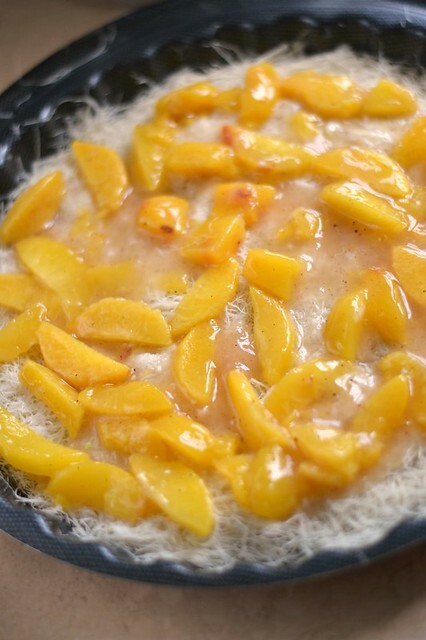 Prepare peach filling by boiling water, corn flour, cinnamon, sugar and vanilla and stirring in peach slices. Pour mixture on top of the first kunafa layer in the pan. A little caramel here can’t hurt. 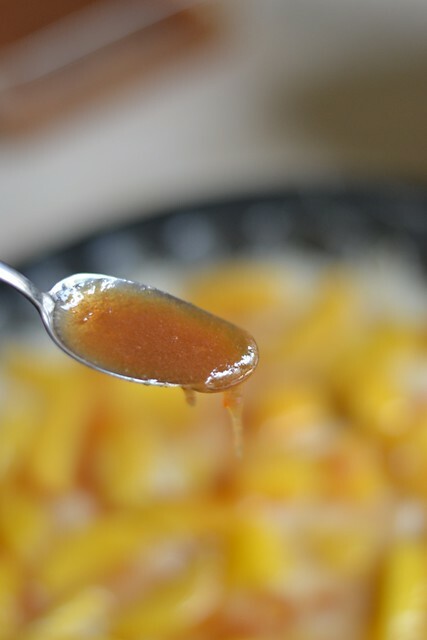 Press in more kunafa on top of the peach filling to create a second layer, creating a kunafa “sandwich”. 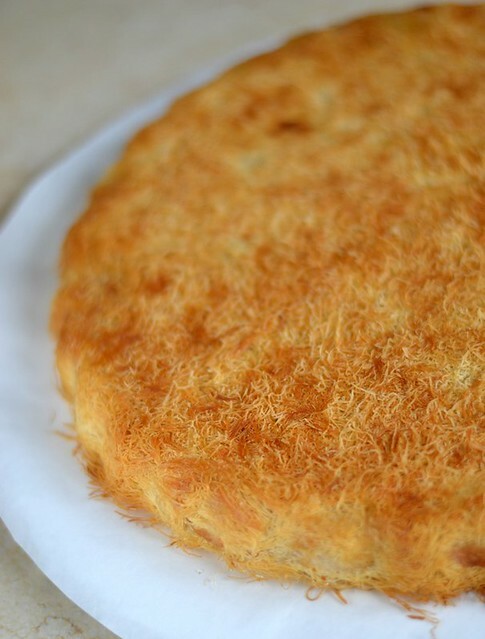 Bake in a preheated 220 c oven until the kunafa turns LIGHT golden brown and take it out. 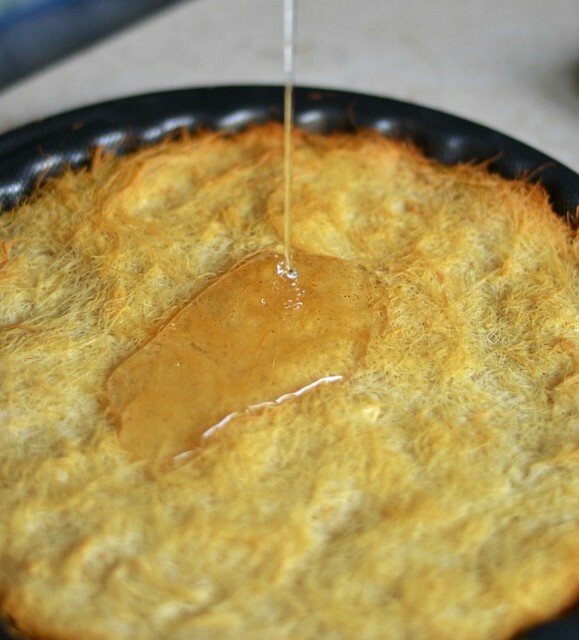 Immediately pour the cold sugar syrup over the hot kunafa while it’s in the pan, drenching it. Flip it upside down on a serving plate with one quick motion. 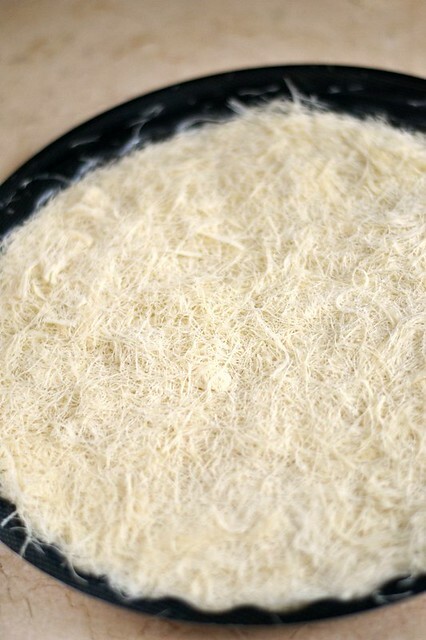 The bottom (now top) kunafa layer will be a darker golden brown than the other side, which is what you want. 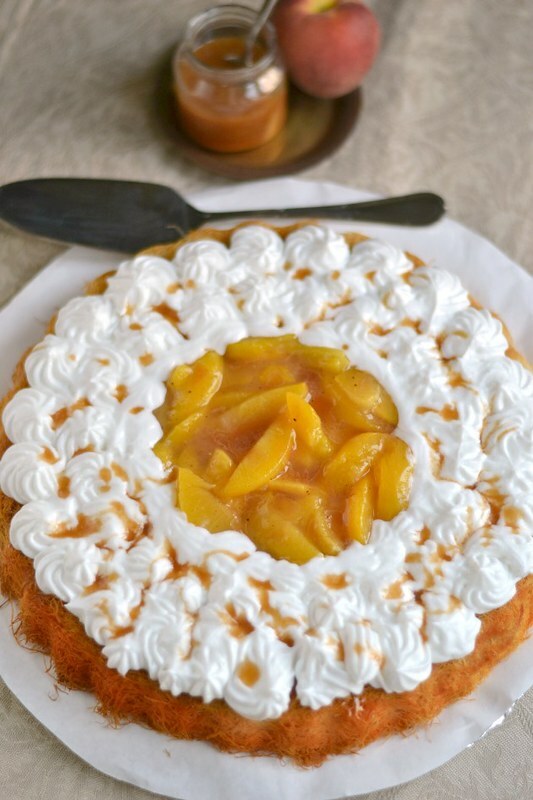 Let the kunafa cool down, then garnish it with the whipped cream and drizzle more caramel on top of it. You won’t be sorry.